Jeff Rogers, a National Merit Finalist and chemical engineering major at UA, grew up in Mountain Brook, Alabama, in what he describes as a privileged environment. Before starting his freshman year at UA, Jeff took part in Alabama Action, a week-long service project for incoming freshmen in the Honors College, and as a result, “I saw what civic engagement could be.” Now a senior, Jeff describes participating in Alabama Action, as a freshman a nd later as a student director, as one of his best experiences at UA, in part because of the strong friendships he made. “Honors touches a lot of parts of my life,” he says. understanding of, the crucial role of education in society. The transformational nature of education can be seen in many of the causes Jeff has since undertaken as a student. 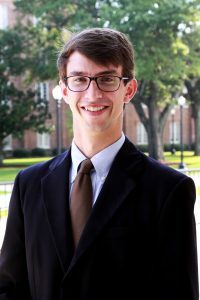 In addition to his leadership in Alabama Action, Jeff is student vice chair of the Blackburn Institute, an organization dedicated to affecting change within the state of Alabama, and vice president of the Southern Poverty Law Center (SPLC) on Campus. Both of these organizations have solidified his understanding that getting involved in causes has long-term consequences and rewards. 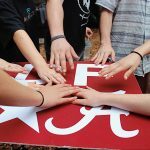 The UA campus, he observes, is intertwined with the larger community in many important ways, which offers the opportunity to have a genuine impact. Jeff describes UA’s campus culture, within Honors and the rest of campus, as genuinely supportive of students’ dreams and goals. One of Jeff’s projects this year, in conjunction with SPLC on Campus and the Honors College Assembly, was facilitating a panel discussion called “Why Nott?” This panel, which attracted over 200 students, faculty, and staff, considered the complicated history of some UA’s building names, including Nott Hall. His interest in the topic, an increasingly common concern on campuses across the country, started with a class the history minor took. Other interested students reached out to him to explore the topic, and he took it to SPLC on Campus. 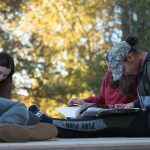 Although the program was not without controversy, Jeff observes that campus “is open to talking about issues,” even some difficult ones. “I find the culture on campus to be supportive. It shows what you can accomplish if you just ask.” Working with faculty and students across campus, Jeff is helping to plan a follow up program this spring.